Housing bubbles happen. They've happened before, the are happening right now and they will happen again in the future. Each time a housing bubble develops people tend to think that it is somehow different this time. Yet it never really is. What goes up eventually comes down. The only difference is the shape of the bubble. Some bubbles form rapidly and deflate just as fast. Other bubbles may take a long time to develop and an equal amount of time to deflate. Then you can have rapid forming bubbles followed by slow melt and vice versa. Add government interventions to the mix, and they can completely mess up the perfect bell curved shape of a bubble. Finally, real estate is local and so are the bubbles. 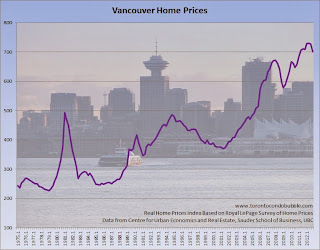 I believe there is a national housing bubble in Canada and that some places are more overvalued than others. 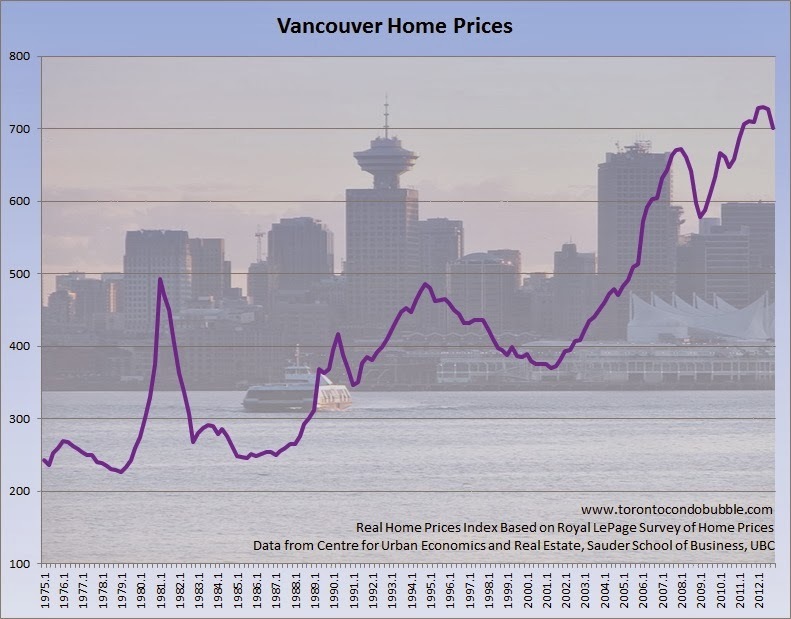 In this post I took a quick look at real home prices in Toronto, Calgary, Edmonton, Montreal, Ottawa, Regina, Vancouver, Victoria and Winnipeg. To start things up let's take a look at the nominal price growth in selected Canadian cities. 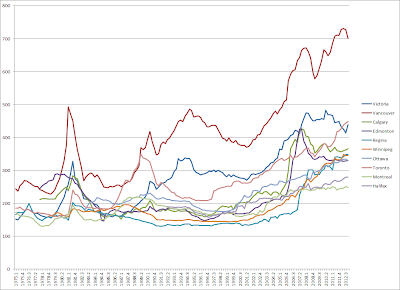 Toronto had a massive housing bubble in the late '80s. Once it popped prices fell by over 40% (adjusted for inflation). Downtown Toronto was hit the worst as prices crashed by over 50%. 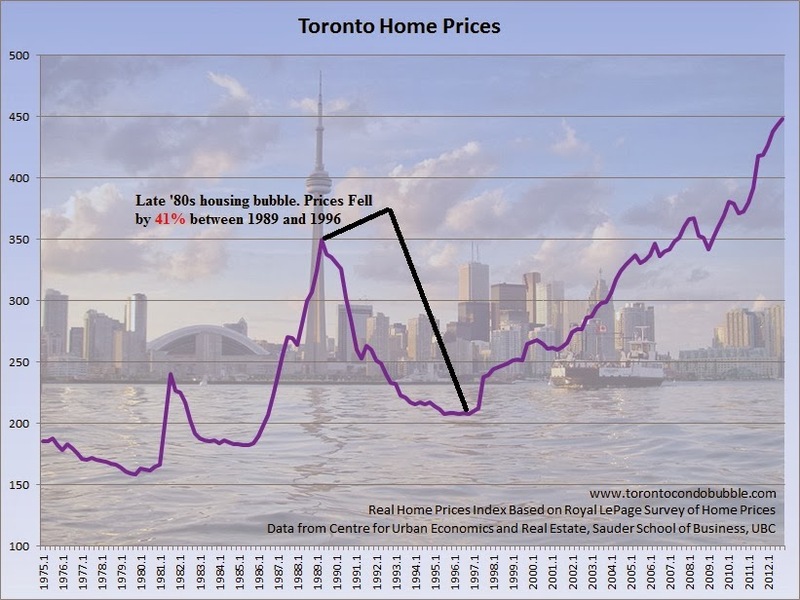 Fast forward to present day, and prices in Toronto are 28% higher than during the peak (1989) of the first housing bubble. Yet, when you account for inflation, Torontonians make $2,200 less today than in 1989. So how come prices are higher today compared to the '80s when our incomes are lower? Since interest rates are already at rock bottom and incomes are stagnating, the future is not bright for the Toronto housing market. 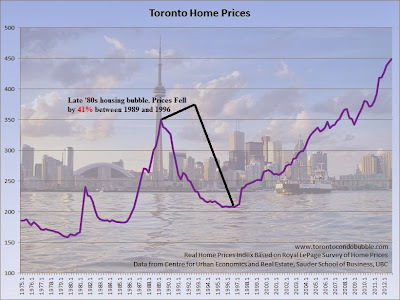 At best home prices will plateau but realistically speaking prices are set to drop significantly in the medium term.You can read more on the Toronto housing bubble here. Detached homes in the City of Toronto went for $856,169 on average this past September. The average condo price was $363,149 in the city. The home ownership rate in Toronto was 68.3% in 2011. Median income (inflation adjusted) in Toronto declined by 3.25% between 1989 and 2011 ($67,700 and $65,500 respectfully). 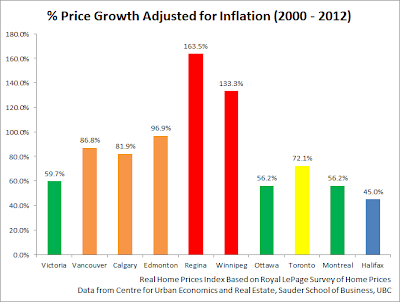 Between 2005 and 2007 real estate prices in Calgary went up by 90% adjusted for inflation. Then came the financial crisis and prices fell by 20%. Since the crash prices in Calgary hit a bumpy plateau. By the end of 2012 prices in Calgary were down 14% from the peak. The average single family home price in Calgary was $516, 244 in October of 2013. The average condo price was $309,414. The home ownership rate in Calgary was 73.9% in 2011. Median income in Calgary (inflation adjusted) grew by 42% between 1989 and 2011 ($58,000 and $82,400 respectfully). What does the future hold for the Calgary real estate market? 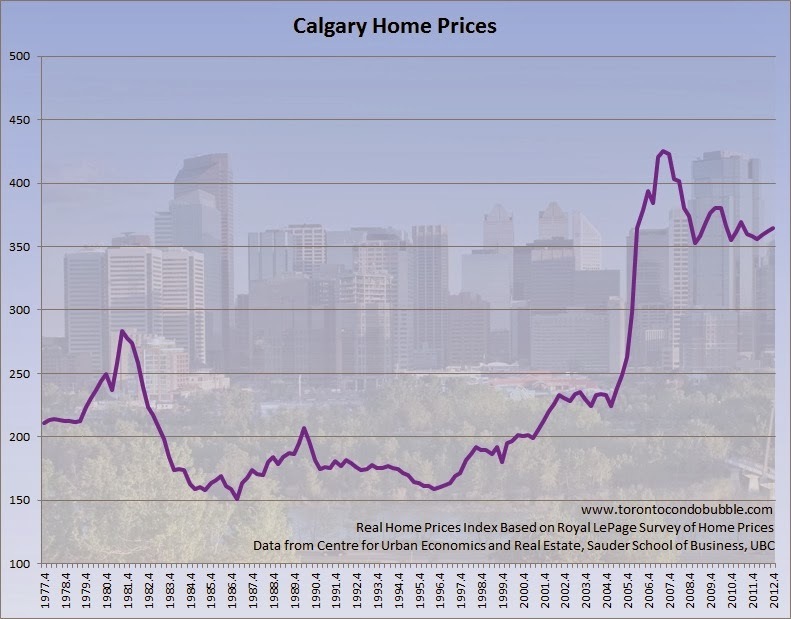 Some say that prices in Calgary were undervalued for a long time and therefore current price appreciation is justified. Additionally, incomes in Calgary increased dramatically during the past two decades. 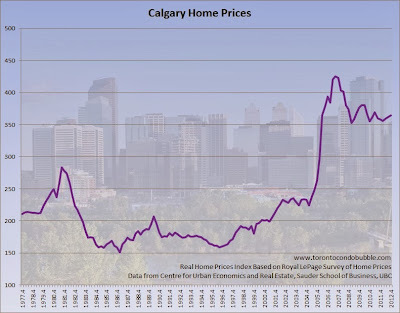 Nevertheless, home prices in Calgary remain way above the historical norm and thus, in my opinion, the housing bubble in Calgary has yet to fully deflate. 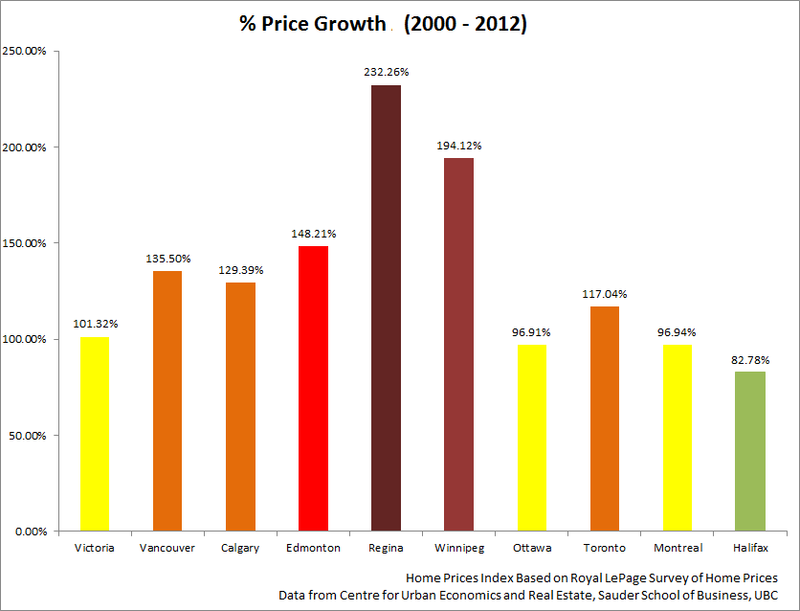 Similarly in Edmonton prices skyrocketed by 100% between 2005 and 2007. Yet the rising incomes and booming economy did not prevent the bubble from bursting. Prices were down by 29% (adjusted for inflation) from the peak. 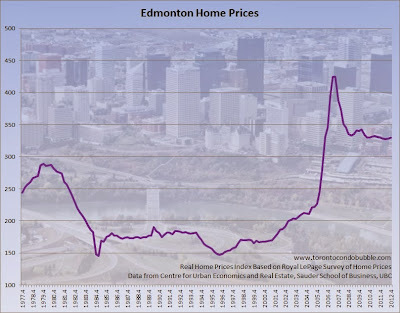 In my opinion the housing bubble in Edmonton is yet to fully deflate. The median income in Edmonton grew by 16.7% between 1989 and 2011 ($58,100 and $67,800 respectfully). 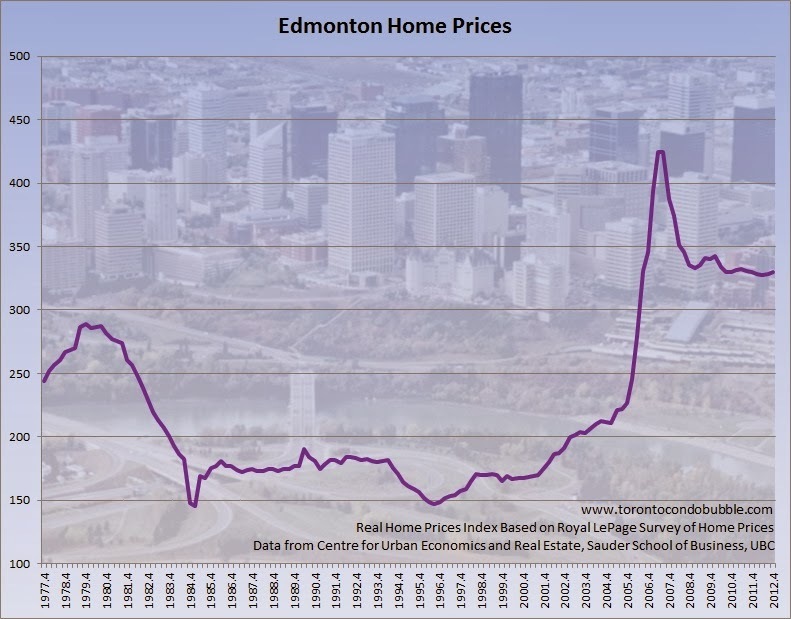 The home ownership rate in Edmonton was 70.6% in 2011. Average detached home price in Edmonton was $408,642 past October. Average condo price was $243,655. 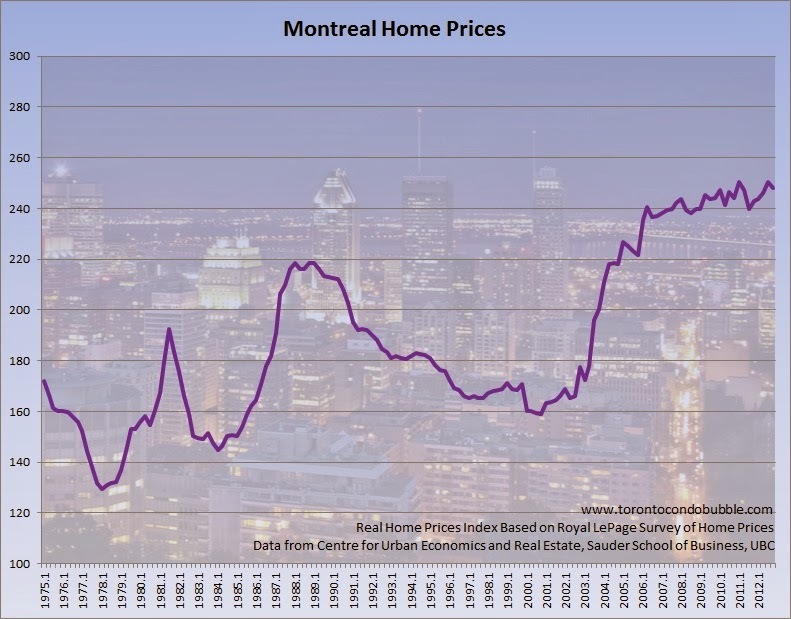 Is there a housing bubble in Montreal? Certainly looks like there's one to me. Home prices cost more today than in 1989 yet median incomes were lower in 2011 compared to 1989. 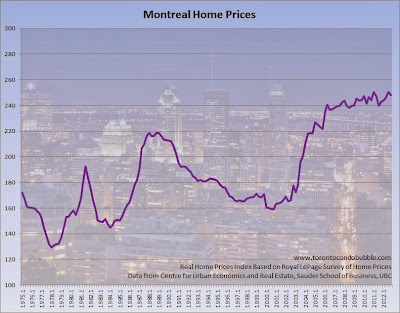 Montreal is not different and eventually prices will return to the mean. Income in Montreal declined by 2.8% between 1989 and 2011 ($53,500 and $52,000 respectfully). The home ownership rate in Montreal was 55% in 2011. In the second quarter of 2013, the average price of Montreal condos was $240,306. Detached bungalows average for $288,868 and two storey homes went for $397,643 on average. 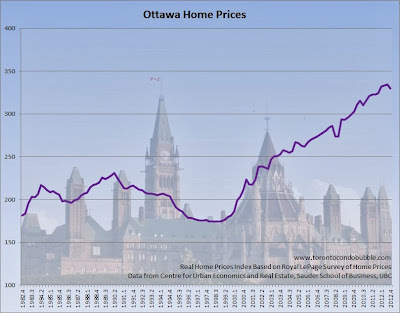 Prices in Ottawa are up by almost 90% since 1999 when you adjust for inflation. Real estate values are significantly above the historical norms and thus I believe prices will fall in real terms in the medium term. The reason for my belief is a thesis by Nobel Prize winner Robert Shiller who says that in the long term real home prices tend to follow inflation. Incomes in Ottawa grew by 13.2% between 1989 and 2011 ($66,500 and $75,300 respectfully). The home ownership rate in Ottawa was 67.9%. The average condo price in Ottawa was $257,059 past September. 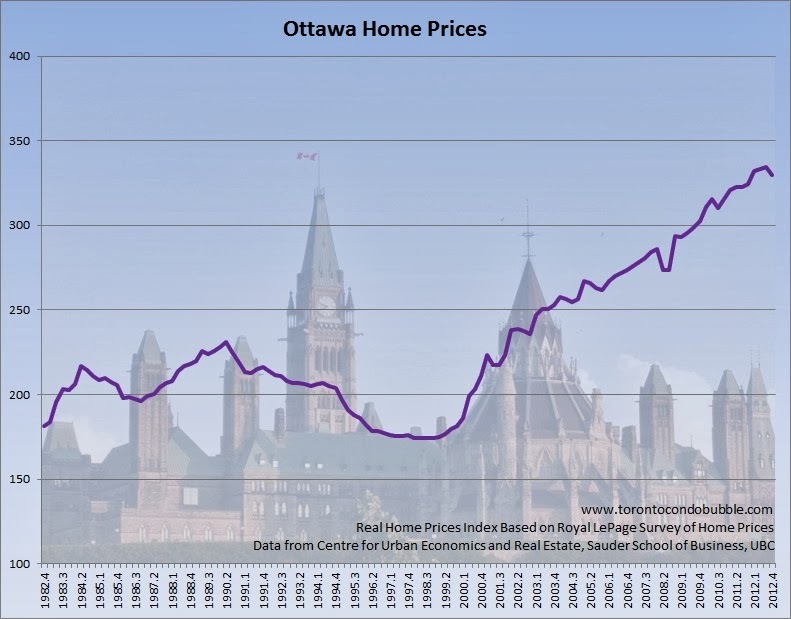 The average home price in Ottawa (excluding condos) was $371,370 this past September. 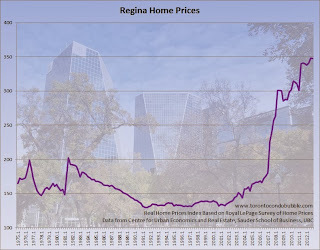 Home prices in Regina grew less than the CPI for quite some time until one day prices shot up through the stratosphere. A housing bubble developed in Regina just like in Edmonton. The only difference is that the bubble has yet to burst. The home ownership rate in Regina was 71.2% in 2011. The average detached house in Vancouver costs $1,211,190 (Sept, 2013). Is Vancouver truly different or is it the most delusional Canadian city of all? The average condo price was $426,899 this past September. "Our jobs and growth plan is based upon condo development and land speculation. However, take that away, and our local economy is as emaciated as your average catwalk fashion model. For far too long, we have associated new condo towers with rising property values. In other words, our region has convinced itself we don’t need jobs to increase our personal wealth — we merely need a hot property market." Incomes in Vancouver grew by 1.8% between 1989 and 2011 ($56,200 and $57,200 respectfully). The home ownership rate in Vancouver was 65.5% in 2011. Victoria is as delusional as Vancouver. Single family house prices averaged $592,452 in October 2013. So far SFH prices were down 8% from the peak. 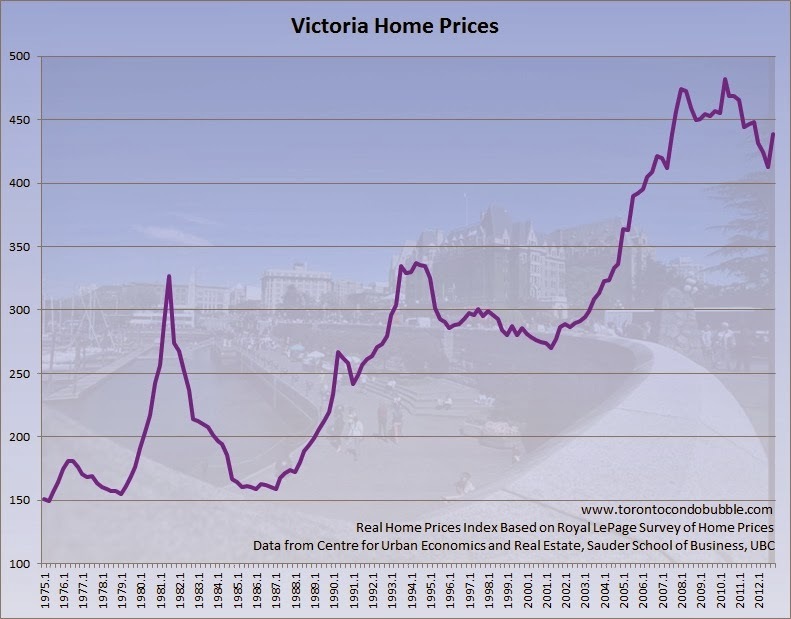 Here's a great article discussing the state of the Victoria housing market. Median income in Victoria grew by 4.2% between 1989 and 2011 ($49,900 and $52,000 respectfully). 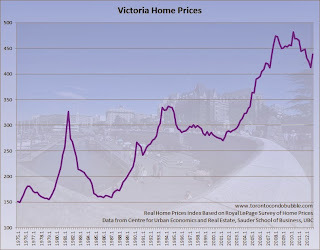 The home ownership rate in Victoria was 65.1% in 2011. 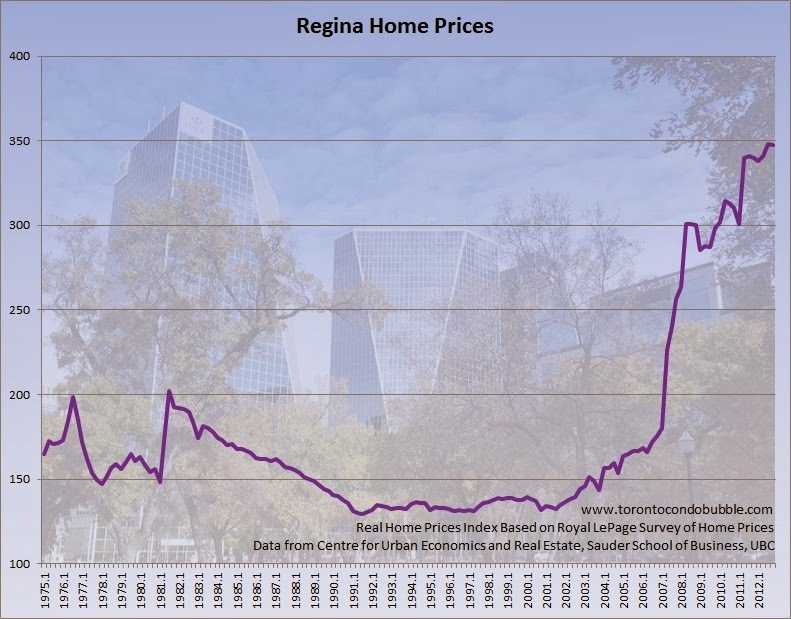 Just like in Regina, home prices in Winnipeg stagnated for over a decade and then shot up to the stars. 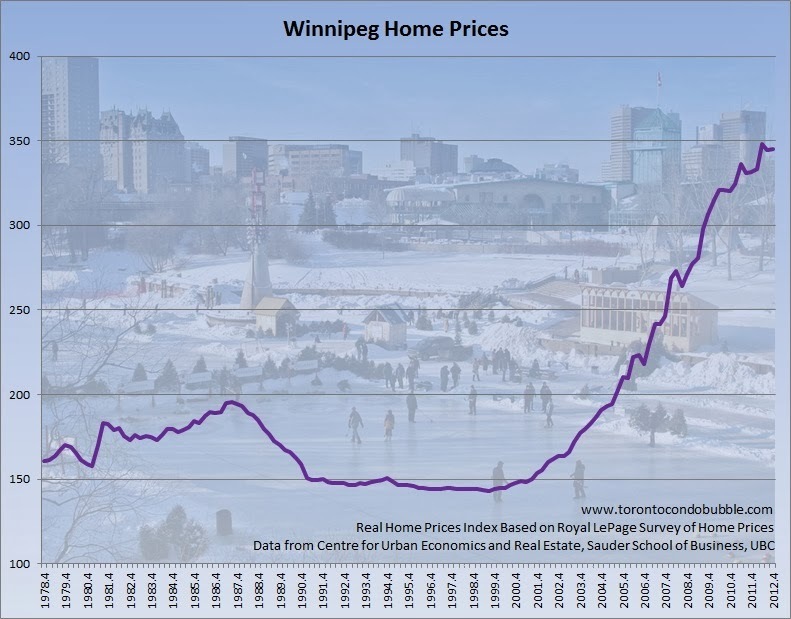 Is there a housing bubble in Winnipeg? I think so. 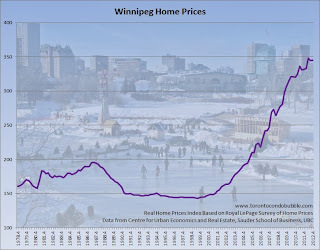 Low interest rates, removal of the maximum mortgage insured limit in 2003, 40-year mortgages - these all played a role in creation of a housing bubble in Winnipeg (or anywhere else in Canada). Average home price in Winnipeg was $241,408 in 2011 compared to $88,611 in 2000. Median income in Winnipeg grew by 12.4% between 1989 and 2011 ($51,600 and $58,000 respectfully). The home ownership rate in Winnipeg was 68.4% in 2011. The chart below is a composite of cities discussed above. 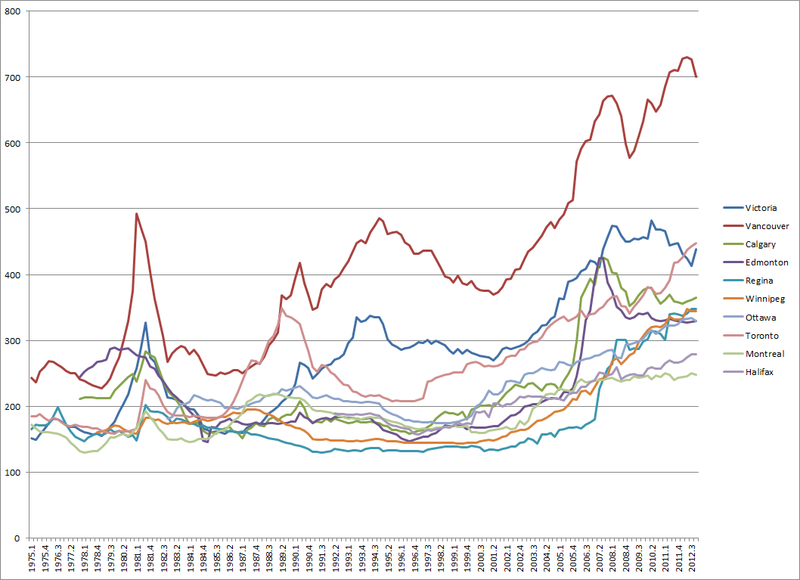 The following chart shows percentage price growth (2000-2012) of real estate in various Canadian cities. The price growth is in real terms - adjusted for inflation. All the above calculations in this article are based on the data from the Center for Urban Economics and Real Estate.